The Jubilee week-end is coming soon! It is another great reason to bake and cook amazing recipes with JUST MILK! 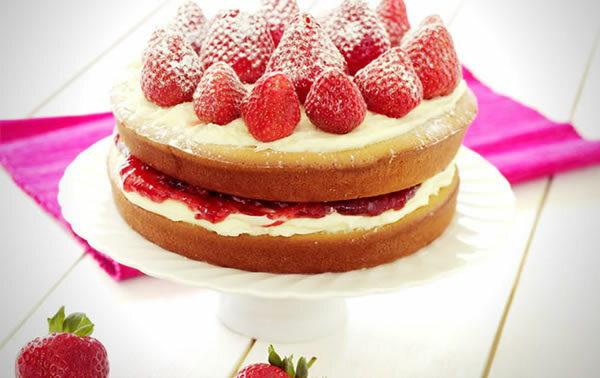 Why not trying our scrumptious Victoria sponge cake? To check the recipe click here. If you fancy joining the fun of the Jubilee’s celebrations in London, read the main program below. We will definitely go and see the 1,000 boats on the Thames! The Queen will attend the Epsom Derby. The Big Jubilee Lunch: people will be encouraged to share lunch with neighbours and friends as part of the Diamond Jubilee celebrations. This may take the form of a traditional street party or a picnic lunch in small or larger groups. This event is being organised by the Big Lunch. Are you organising any street parties with your neighbours yet? Tell us, or share your pictures on our Facebook page, we would be more than happy to see your cooking feast! Up to a thousand boats will muster on the river as The Queen prepares to lead one of the largest flotillas ever seen on the River Thames. Tickets are still available for the Diamond Jubilee festival in London’s Battersea Park, which will offer a great vantage point to view the pageant. The festival will celebrate design, music, art, film, fashion and food from the past 60 years. Members of the public will also be able to watch the pageant on a number of big screens. A concert is organized at Buckingham Palace by the BBC and will be attended by The Queen, The Duke of Edinburgh and other members of the Royal Family. The ballot for tickets has now closed but the concert will be broadcast live on BBC One, Radio 2, and on big screens in Hyde Park, St James’s Park and The Mall. Thousands of beacons will be lit around the world to commemorate The Queen’s 60 year reign over the UK and as head of the Commonwealth. The Queen and other members of the Royal Family will attend a national service of thanksgiving at St.Paul’s Cathedral. Later in the day, the Royal Family will travel from Westminster Hall to Buckingham Palace by carriage, along a processional route. Shortly after their arrival, the Royal family will appear on the balcony and an RAF fly-past will take place. To have more details about all the great Diamond Jubilee events, click here. What’ your plan for the Jubilee week-end?! !